It is a well-known fact that medical treatments alone are not enough to deal with certain respiratory conditions. Even before the pharmaceutical industry had come up with an arsenal of drugs that include the use of cortisones, the most frequent treatment for respiratory conditions was topical. The reasons why certain people are more prone to allergies than others are as varied as the possible treatments. Nonetheless, the development of respiratory infections would seem to mushroom in some areas and seasons more than others, thus making it clear that the environment we live in plays a vital role in our overall health. Those who live in dry areas have gotten used to feeling throat dryness and difficulty in breathing. However, physicians have made it clear that finding ways to improve these conditions is vital if breathing comfortable is the goal. Humidifiers make great weapons when it comes to fighting respiratory conditions and improving the air quality around us. Even so, finding the right one can take a while and may eventually take place after a long period of trial-and-error has taken place. Since the amount of pollutants present in the air in most large cities is one of the major causes behind some of the most common respiratory syndromes, taking care of the air and its quality should be an important step on our road to sanitation. But how is it possible to sanitize the air in your home? Since antibacterial sprays are definitely not enough, we should resort to a further-reaching method. Luckily, humidifiers have been found to be efficient alternatives to other professional high-budget options. This Honeywell Germ-Free device helps to control up to 99% of bacteria, mold, viruses and fungus. In addition, by using Protec, which is an antimicrobial filter that has been especially treated for this purpose, users can rest assured that no pollutants are being released into the air. Finally, all contaminant agents that may be found in the recipient’s water are effectively killed thanks to the use of a unique type of UV technology. These days most people are looking for practical solutions that will help to deal with everyday issues. The Honeywell Germ-free Cool Mist Humidifier possesses features that make it eligible for optimal user-friendliness at least as far as maintenance is concerned. First off, unlike other similar products, the whole device is easy to clean. For example, all parts are 100% dishwasher safe, thereby making it easy to clean without much hassle. In addition, because the container has a wide tank opening, it is easy to wash under the faucet. All it needs is a soft brush and a kitchen towel to thoroughly clean and dry the tank where the water is located. Finally, the filter is also easy to come off and wash. Since this procedure must be done on a weekly basis, efficient cleaning is a must. Remember though, that even when the filter gets cleaned periodically, it must be eventually changed in a few months, or so. Honeywell has a long tradition of providing sound engineering products and services that are aimed at making people’s lives better. When it comes to ensuring air quality, the company’s name is certainly synonymous with clean air. However, prestige alone would not be enough to ensure so many positive reviews. Consequently, it is only by reading some of the hundreds of positive reviews that one can begin to understand just how far-reaching some of the benefits of this product can be. Another major asset is low maintenance. 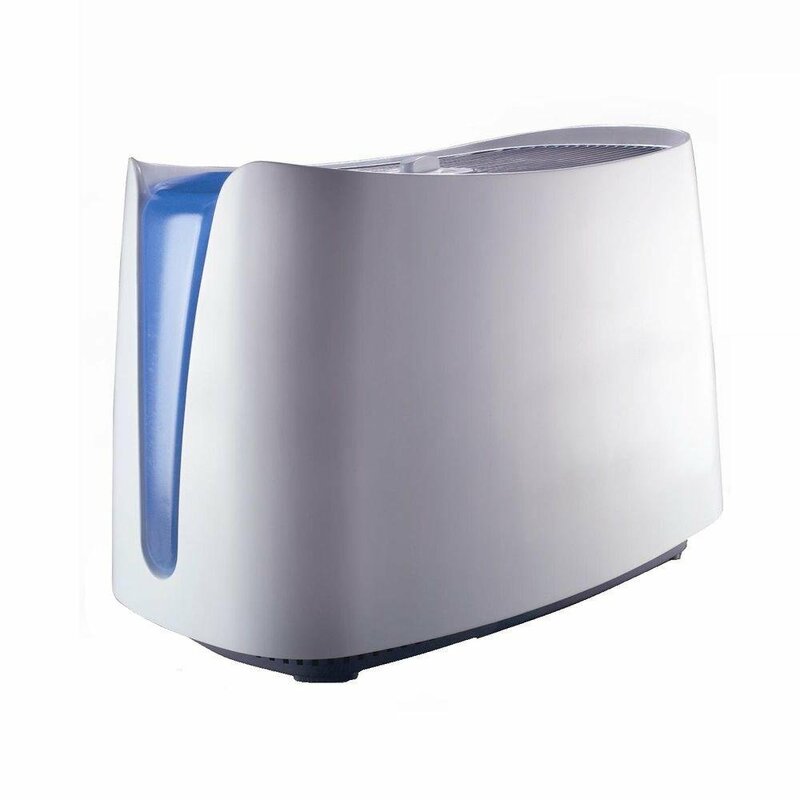 Because of the use of an effective top-notch filter, the unit does a good job keeping the air 100% free of fungus, germs and viruses. Whereas one would expect the cleaning part to be messy, users report that cleaning and changing the filter is much simpler than one would expect. In addition, reloading the container is also a simple task mainly because of its wide opening that allows for easy refill under the faucet. Assembly is another quality many users mention often. It is easy to put up and to take apart when you need to clean it. This is very convenient for people who don’t have time to waste. All parts are dishwasher safe, so once the wintery season is over, you can wash it and put it away safely. On a less happy note, a small percentage of users have expressed their dissatisfaction regarding the mist’s temperature. First off, potential buyers should know beforehand that this humidifier is meant to be cool and when it works at high settings, it generates more mist than most other devices, thus spreading the cool air even further. In dry winters, those who worry that the temperature may drop down too much could try placing the humidifier in corners away from beds, for example. In conclusion, a larger-than-average, high performance unit that does what it is meant to.